Leo Allen Herman Eason (# 17 in the list of senior men to represent Great Britain) was born in Gravesend, Kent, in 1933. His mother being a devout Catholic named her son after Pope Leo. This was rather fortunate as Leo's father wanted his son to be called Herman Eason after Herman Goering. Little did the family know what this name would come to symbolise just a few years later. When war broke out in 1939, Leo's father was stationed to Birmingham where he worked at Elmdon Airport repairing aircraft for the war effort. The family also moved and aged six Leo had found himself a new home. The family lived just a stones throw away from the Birmingham Embassy Rollerdrome in Walford Road and throughout his teens Leo made the rink his second home. He joined the Birmingham Roller Speed Club and in 1951 aged 18 joined the NSA. Very soon he was getting himself noticed and just a few years later was knocking on the door of international selection. It was a golden era for British speed skating, with the likes of World medallists Geoff Wright, Denis Hill and Don Brown all competing. Eason had some stiff competition as well as some great names within his own club that could only serve to improve his strength and speed. In the 1952/53 season the Northern Counties Championship and Midland Counties Championship were combined for the very first time. At Granby Halls, Leicester, on 29th November 1952, Eason won his first major gold medal by winning these two "combined" events just ahead of another 'wannabe' international, Graham Stead. Despite this victory, another major individual medal of any colour would not materialise until 1956. 1956 was a major year in Eason's life for whole number of reasons. On 18th February in front of his home crowd at the Birmingham Embassy he won his first British title, the One Mile British Championship, again just ahead of Stead and another emerging star, Les Woodley. Eason had also been courting British women's international, Pat Harris, also of the Birmingham club, for some time, and shortly after Eason's victory the couple got married. Later that year Eason got his first call up for Britain at the World Championships in Barcelona in the October. With his new wife also in the team it was effectively a "honeymoon" for the newly weds. Unfortunately, there was to be no fairly tale ending. Eason would return home from those Championships as the only British skater to have not won a medal. Skating in only two distances he would finish 11th in the 1000 metres and then in the 5000 metres would kick a track marker exiting the last bend and fall just metres from the finish line which would have secured him a silver medal. Team mate Woodley capitalised on Eason's misfortune by taking the silver, with Stead the bronze. Also in those Championships the German connection once more made an appearance. In the relay, one of the German teams (a country could enter more than one time in those days), short of a skater through injury, asked Eason if he would make up the second man. Eason duly obliged and became the first (and the last) British skater to wear the shirt of two nations at the same major Championships. His team would finish fourth, again just missing out an a medal. 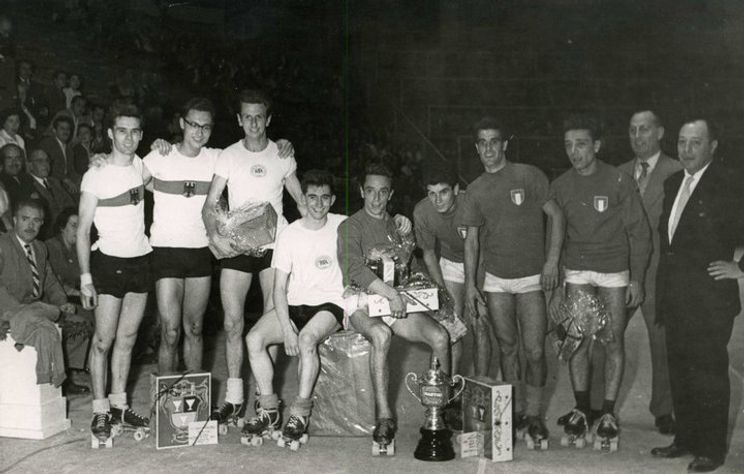 In 1957 Britain did not send a team to the World Championships in Palermo, Italy, citing "lack of suitable training facilities, short notice and expense" as reasons for not attending. Back home, though, Eason was now the man on the move. By the time the British Championships came round in February, Eason had already won the Midland Counties Championship. Then in the February he would finish third in both the Half Mile and One Mile Championships before securing his second title in the Five Mile Championship again at the Birmingham Embassy. The 1958 British Championships had been a relatively lean year for him with only a silver medal in the Half Mile, however, he was once more called upon to wear a British jersey in a World Championships. This time it was the road circuit in Finale Ligure, Italy. Alongside him was 18 year old Danny Kelly. Eason skated in three out of four events, being dropped from the 5000 metres in favour of another newcomer, Dennis Stafford. Whilst Eason would finish 4th in the 1000 metres, these Championships belonged to Kelly who managed two silvers and a bronze. Again Eason came away empty handed. Undeterred, he returned home and set about his training in readiness for his next crack at a World title. A year later, and Eason had once more found his form, winning two out of three British titles. Unfortunately, once more there failed to be a major international Championships and not for the first time would Eason find himself in the disappointing situation where he was truly "on song" but without a platform to show it. 1960 proved to be another landmark year for Eason. He was now 27 and well established amongst the British elite and had earned himself the nickname "The Fox", a name given to him by Henry Crystall who suggested that you never knew when and where Eason would strike in a race. It was an appropriate name that he would be recognised by for many years afterwards. 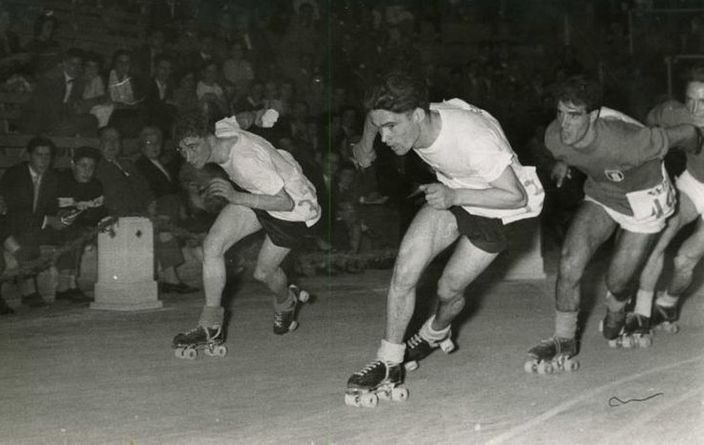 Late in 1959 Eason had been asked by the New Zealand skating federation if he would go to New Zealand and take part in a series of exhibition races over a number of weeks. Unfortunately for Eason, work commitments did not allow this and Danny Kelly took his place. Shortly afterwards, Eason was again approached by the New Zealand skating federation who this time wanted to send over two skaters to train and race in Britain for a lengthy duration and who would subsequently skate for New Zealand at the forthcoming World Championships in Wetteren, Belgium in September. Arrangements were made and Mervyn Wybrott and Ian Hughes came to Britain and started to learn the ropes, as it were. Training with the Birmingham club, Eason took them both under his wing and effectively coached them and passed on his knowledge. Eason's input was to prove invaluable and have a profound effect on the duo. On 16th April, Wybrott finished third in the One Mile Championship on Brixton, becoming the first and only non-British skater (that did not have dual nationality) to be awarded a national Championship medal. By the time the World Championships came around in September, the New Zealand boys were looking for someone to act as their Team Manager. Whilst Eason would have been the obvious choice, his own selection for the British team obviously made this impossible. Subsequently, Cliff Stafford (later the father of multi-British Champion Chris Stafford and older brother to 1958 international Dennis Stafford) took on the role. The first day proved relatively successful for Britain. Danny Kelly managed a silver in the men's 10000 metres and Barbara Woodley a bronze in the women's 10000 metres. However, an incident in the men's 5000 metres would happen that would continue to be talked about even now, decades later. Coming into the last bend Eason had the inside line. Outside of him was Faggioli (Italy) and Lachambre (France). As Lachambre was making his move, Faggioli moved across to block the Frenchman where the resulting collision pushed Faggioli into the side of Eason who put a foot inside the dotted track line. Out of the ensuing melee Eason exited the bend first and raced up the finishing straight, crossing the line first and firmly believing that he was the new 5000 metres World Champion. Unfortunately, the Referee did not see it that way and Eason was declassified to last place for his "infringement". Despite understandable protestations and appeals by both Bert Lamb (British Team Manager) and Henry Crystall (British Official) the decision to declassify Eason stood. Lachambre was proclaimed the winner, Faggioli second and an unexpected bronze medal went to Wybrott, capitalising on his friends unfortunate circumstance. WETTEREN 1960 - EASON PUTS A FOOT INSIDE THE WHITE LINE AND GETS DECLASSIFIED TO LAST PLACE FOR THE "INFRINGEMENT"
"The occasion was a most unsatisfactory one for the British party of competitors and Officials, and in several instances there were deficiencies in organisation and which, when brought to notice, were not rectified.... Added to the many incidences of mismanagement and wrong decisions to which attention was drawn, Mr. Lamb felt obliged to withdraw the British team from its engagement, action which had the approval of the British skaters and several other experienced speed skaters from this country." "...there should be no reason, whatever the circumstance, that a team should be withdrawn from any major international competition"
Britain still had all three men (one of whom was Eason) and two of the three women in the knock out competitions when the team was withdrawn. Yet another chance had gone begging and Eason was again left wondering when his next chance would come. There was some consolation, albeit small. The last event, the 20000 metres, which took place without the British team, was won by none other than Mervyn Wybrott! In Eason's eyes it was the next best thing for him, having had so much influence on the young Kiwi. On his return home, unbeknown to him, his skating friends made him his very own "rainbow jersey" and stood him atop a makeshift rostrum, proclaiming him to be the World Champion they all believed he really was. As sentimental and as fitting a tribute as it was, he knew that the real thing still eluded him, and time was ticking. 1960 - LEO RETURNS FROM WETTEREN WHERE HIS FRIENDS CELEBRATE "WHAT SHOULD HAVE BEEN"
During 1961, such was the apparent arrogance of the British skating federation that they announced that they were still protesting at events from the previous year and refused to send teams to either the World Road Championships in Gujan Mestras, France or, indeed, the track Championships in Voltrega, Italy. Once again, it was the skaters who would suffer and once again more missed opportunities for Eason, especially with there being two World Championships in the same year! Eason, himself, would again win the Five Mile British Championship and having been born in Gravesend, Kent, decided to enter himself for the Southern Counties Championship, which he duly won. His victory in this event on the Herne Bay rink meant that Eason would become the first and only person to have ever held all three (Southern, Midland and Northern) Counties Championship trophies. Towards the end of that year, again an invitation was extended to him by the New Zealand skating federation to attend a number of exhibition races. This time, along with his wife, Eason duly obliged. 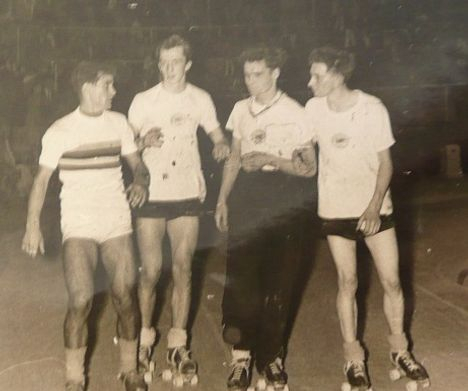 His return to international skating came in September 1962 when he competed in the World Championships in Venice-Lido, Italy. Again, a medal of any colour still eluded him and again he returned home empty handed. Twelve months later, however, all that was to change. In 1963, again a British title eluded him (in fact, despite still winning British Championship medals right up until 1971, his victory in the Five Mile in 1962 would be his sixth and last individual British title). Although having been in every British team selected since 1956 he had only competed in four World Championships. That year they were held In Nantes, France and once again Eason was selected, this time, though, his wife was not. The first race was the 5000 metres. Throughout the race Eason felt good, probably the best he had felt in a long time. He finished the race just behind Italian legend, Guardigli, with a silver medal, his first ever World medal of any colour. Finally, he had got the monkey of his back and was a World Champion medallist. Later that day was the 10000 metres. Brimming with confidence gained earlier, Eason found himself at the front coming out of the last bend and sprinted the finishing straight, taking himself clear of the chasing pack. In an instant, and at 30 years of age, he was finally a World Champion...and Britain's first since before the war. The following day he found himself in the semi-finals of the 1000 metres knock out, along with team mate Danny Kelly, and two Italians, one of whom was the sprint favourite Guardigli. The Italian officials wanted the two Italians in one semi final and the two Brits in the other semi final, which would have assured Italy of at least one skater in the final. However, Henry Crystall, now British Team Manager, was having none of it. He insisted that in each semi final should be a British skater and an Italian skater. Both Eason and Kelly beat their opponents and found themselves in the final of the 1000 metres knock out. It was at this point that Eason took Kelly to one side and unselfishly told him that he had got his Championship and that this one was for him. The final was always the best of three rounds, and in the first round although Kelly crossed the line first the judges decided that Eason was not "putting in enough effort" and made them re-run. The following two rounds the skaters had to put on an exhibition of "effort" to the judges, but the outcome was the same. Kelly was World Champion and Britain had not just one, but two, World Champions at the same event. 1963 saw Eason realise his dream and in 1964 he was awarded the National Skating Association's "Vandervell Trophy", a trophy awarded by the N.S.A. to the skater who has put up the best performance in the (preceding) year in any skating discipline, ice or roller. Eason's performance in 1963 would be the first and last time he achieved medals on the World stage. 1964 and 1965 would see him finish in the top ten but by now he was the senior figure within the team. Britain did not send a team to Mar del Plata, Argentina, for the 1966 World Championships and the 1967 World Championships were for women only. In the first ever European Championships that same year, Eason was not selected for the British team. Suddenly the former World Champion was being overlooked. When selection was made for the 1968 World Championships to be held in Vicenza, Italy in September, it was already known that the 1969 World Championships would be in Argentina. Three of the four skaters had pretty much cemented their place in the team (Sharman, Folley and McGeough) but the fourth place was up for grabs. It came down to a choice between Eason and 19 year old new boy, John Fry. It was decided that Eason would be preferred to Fry on experience. At the selection meeting Eason was asked if he was available for Vicenza, his reply was "yes, and I'm available for Argentina next year". Eason's performances in 1968 were a shadow of his past glories. His highest placing would be 11th in the 5000 metres. Despite this he returned home and prepared for Argentina, however, it would prove to be a futile gesture. It was whilst at a training session at King's Norton factory centre that he became aware that suddenly he was out of favour. During a conversation with Fry, the youngster told him that the British squad was preparing for Argentina at the 200 metres banked indoor athletics track at R.A.F. Cosford and that he was aware that Eason had not been invited. This was news to Eason who immediately set about asking questions of the Roller Speed Committee. The reply came back in a letter, thanking him for his efforts in previous years but they now deemed him "too old". These were the exact words used and understandably Eason was more than a little aggravated, but the decision was made. The team returned from Argentina in December 1969 with John Folley having won the 10000 metres, the distance Eason had won just 6 years earlier. In February 1970 the Five Mile British Championship was held on a new rink, the Leeds Olympic. Eason still felt he had a point to prove and set out to do just that. Taking the front about half way through the race he skated the track like a man possessed, as tight and as fast as he could. His pace was such that he led right up until the last lap. Fry won the title with Folley second and Eason a close third. He may not have won but felt that he had proven something, if not to the watching officials, then to himself. A year after that and he would finish second in the same event (now the 8000 metres) still feeling that he had what it took. But there was to be no back-tracking from the Committee's decision, and Eason knew that his time was up. There were to be no World, European or indeed, British Championships in 1972 and shortly afterwards Eason called it a day. His wife, Pat, was still competing (and winning medals) at international level and he spent his time supporting her. In 1976 he came across a group of youngsters at a Leisure Centre in Oldbury who were skating around one of the sport's halls that was being used as a makeshift roller rink. Always with a keen eye for talent Eason approached these youngsters and very soon he was back in the swing of things, this time as a coach. Within a couple of years some of these youngsters, the likes of John Downing and the McGrath brothers, Jerry and Mark, would be winning British Championships of their own and go an and get selected for Great Britain. John Downing and Jerry McGrath would even win medals at European Championships. On 25th September 1978, Eason rolled back the years and took to the track competitively for one last time. It was the British Relay Championships at Southampton and Eason made up one of four skaters in the Birmingham team. Alongside Kevin and Jerry McGrath and Gary Vile, Eason helped the team to third place behind Mercia and Alexandra Palace. In 1980 he was asked to be the British Team Manager for the European Championships at Southampton. It was the first time a major international Championships had been held in Britain since 1938 and was fitting that our first World Champion since the war should take on such an important role. It wasn't an overly successful Championships for Britain but the men's team did come away with a bronze medal in the relay. For some time afterwards Eason put his knowledge and experience to good use as an official. For many years, both he and wife, Pat, could often be seen at race meetings, this time supporting the sport from the middle. They also donated many trophies to the sport which are now used to recognise British Champions and annual performance awards - trophies such as "The Fox Trophy" (Junior Boy's 16 to 17 years 1500 metres indoor British Championship), "The Pat Harris-Eason Trophy" (women's 1500 metres indoor British Championship), "M & T Eason Award" (Skater aged between 6 and 12 years who 'shows the most promise'), to name but a few. Sadly Leo passed away on August 4th 2017. Right up until the end he could be seen around a race track enthused by the new blood and giving words of encouragement. The sport had been his life for over 60 years, giving him immense pleasure and taking him to the tallest pinnacle that can be reached of any speed skating career. When you talk about British skating legends, Leo Eason was the real deal.